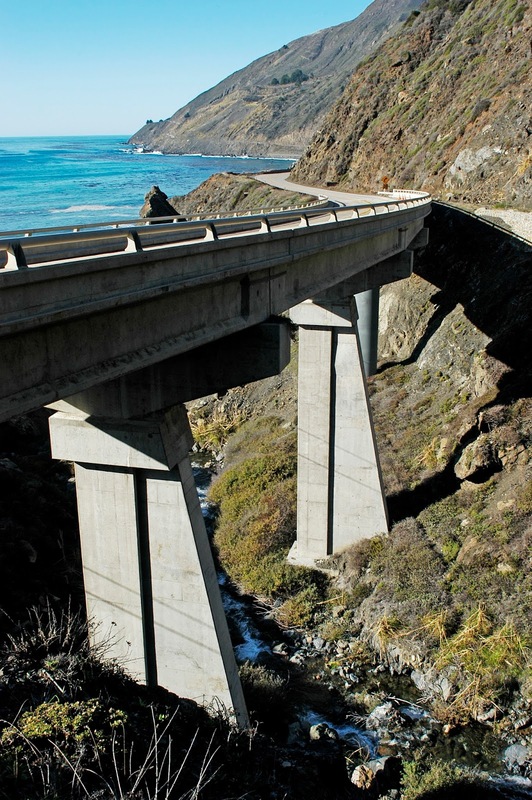 We've headed to the southwest corner of Monterey County to study a few more coastal bridges. 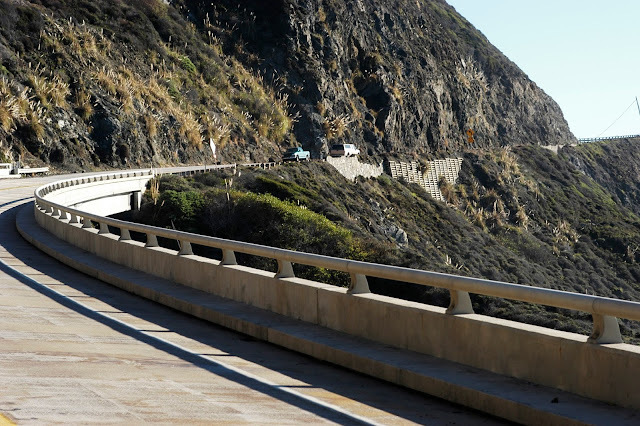 The Limekiln Creek Bridge (44 0058) is a six span prestressed precast I girder bridge that was built in 1957. The girders sit on hammerhead bent caps and single column bents. The bents at the ends of the bridge are round while the bents on each side of the creek are rectangular (to provide less resistance to high stream flows). This bridge was retrofitted similarly to the previously studied Dolan Creek Bridge. The rectangular columns were retrofit with flying buttress-type shear walls while the round columns were retrofit with steel casings. I took these photos in December of 2003 while looking for bridge damage following the San Luis Obispo County Earthquake (to the south). However, the only significant bridge damage was to the nearby Villa Creek Bridge that was damaged by a falling boulder during the earthquake. We'll continue exploring the theme of rockfalls and safety in the next few blogs. Rockfall sounds like Pitkins Curve and Rain Rocks will be discussed in the coming weeks. I am looking forward to it. PS, Congratulations on winning the James E Roberts award.